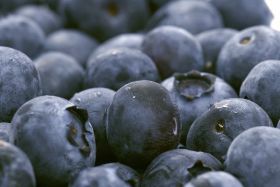 Chile’s blueberry industry set a new export record this season, with the 2017/18 campaign closing with a shipment total of more than 110,000 tonnes. However, the Chilean Blueberry Committee warned that although the results are better than in 2016/17, the effects of the weaker and fluctuating dollar will impact returns. Andrés Armstrong, executive director of the committee, said that exports for this campaign were up 6 per cent on the previous season, with weekly shipments within what can be considered a “normal” range, so the campaign was definitely ending more positiavely than the previous one. "The main problem of last season was that the harvest came almost four weeks early, and the markets were not prepared to receive such high volumes of fruit at that stage. “This did not happen this season, and it developed in a more orderly manner, despite the increase in volumes not only from Chile, but also Peru and Mexico,” he said. Amstrong added that because stocks had not been allowed to build up in the US market, supermarket were better able to programme their promotional actions, leading to more orderly sales and more stable prices. “What’s more, this season we had better fruit quality and flavour thanks to the hard work of growers, through better management of orchards, varietal replacement and the more widespread use of new technologies,” he explained. For his part, Ronald Bown, President of ASOEX said: "The fresh fruit industry in Chile is growing thanks to the work of producers, exporters, and also public sector support, which is a sector that is concerned with complying with the higher safety standards, innovate in technologies, improve production processes, packaging, and logistics, so that fruits arrive in the best conditions to the different destination markets, and that is what is being consolidated today, through this new record in blueberry shipments, we are the main exporter of blueberries in the world, and this type of results allow us to continue consolidating this position ". North America still accounts for the bulk of shipments (64 per cent), followed by Europe (24 per cent), Asia (12 per cent), Latin America (0.2 per cent), and the Middle East (0.1 per cent). However, Europe was the market with the highest growth this season (+12 per cent), due mainly to increased consumption in countries like France, Italy and Russia. It was followed by Asia with 5 per cent and North America with 4 per cent. This season’s growth was partly due to new promotional campaigns, including the first marketing campaign in China through vending machines in conjuntion with Miss Fresh, one of the largest Chinese e-commerce companies.